Briefer than Literal Statement: Library Books..
As you can see my reading at present is quite crime heavy. 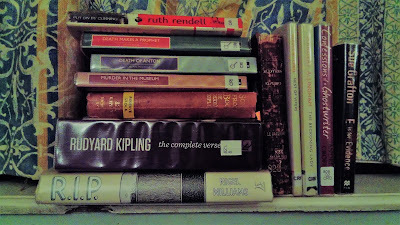 This isn't even all of it, there was the aforementioned Patrick Butler for the Defence by John Dickson Carr, which was a green penguin, The Black Stage by Anthony Gilbert, also a green penguin, and then Grave Mistake, Artists in Crime and Death in a White Tie all on Kindle and by Ngaio Marsh. 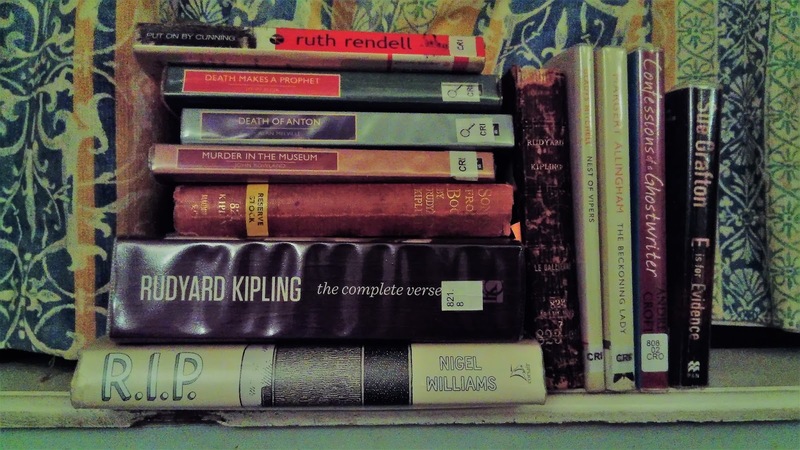 Eventually I expect I'll get a kind of literary indigestion and have to ease off the crime for a while, but there is a kind of historical interest in reading mysteries (or any period 'genre') this way. The Black Stage for example is written just after the war, and family members are coming together as a group for the first time since peace was declared, some of them embracing or at least accepting the changes in themselves and society, while others want to turn the clock back because nostalgia is how they’ve got through the last six years, and it's a fantasy they can't let go of. On the other hand White Tie (which I’ve read before) is set before the war, in the glittering world of high society, debs and chaperones and the London Season. And what it makes explicit, which had never struck me before reading it, was how very young the debs being launched on the marriage market were. 17 or 18 years old, and presumably most of them with no prospect (unlike their male counterparts) of an alternative, such as further study. It is also relatively rare in having one of the most likable murder victims I've ever met. Generally in whodunnits, victims either tend to be the kind of people no-one mourns (a fact Christie satirises through her crime writer character Ariadne Oliver in, I think The Pale Horse) or succumb to their fate within the first few pages (in extreme cases, as in Patrick Butler, all they ever do is rock up and die). This enables the reader not to care very much and treat the whole thing as a kind of intellectual puzzle or amusing farce. But in White Tie we have someone who will be genuinely missed. Someone flawed and privileged, old fashioned and eminently mockable, but generous, human and well meaning as well. Returning to the Library pile though, I'm still finding the British Library reprints quite varied. John Bude's Death Makes a Prophet was well written, but again it was more the time and the setting - a kind of well-heeled and respectable cult of a kind I wouldn't have thought existed in the 40s - that was interesting to me. Death of Anton by Alan Melville was great fun though. Tigers! Acrobats! Accidents that aren't really accidents! Possibly my second favourite of these reprints after The Poisoned Chocolates Case. I did have one tiny quibble though. The investigating officer has a brother who is a Catholic priest, and at one point the murderer confesses to the priest, which creates a quandary, because he can't betray that confidence but can't let an innocent man be arrested either. And of course this makes for a strong and interesting literary device, and highlights the respect the brothers have for each other’s respective vocations – but I’m not sure it’s really possible. After all it is called an act of contrition because you’re meant to renounce your sins and mend your ways. Just conveniently offloading them and then carrying on as before isn't enough, and if a lapsed Catholic like me knows that then any priest worth his salt would surely point it out and refuse absolution as well. But this is like quibbling over the fact that Alleyn is investigating his friend’s death in White Tie, which I’m equally sure would never be allowed, even in high society in the 30s. You do need, with murder mysteries, to suspend your disbelief at least a little if you expect to be entertained.